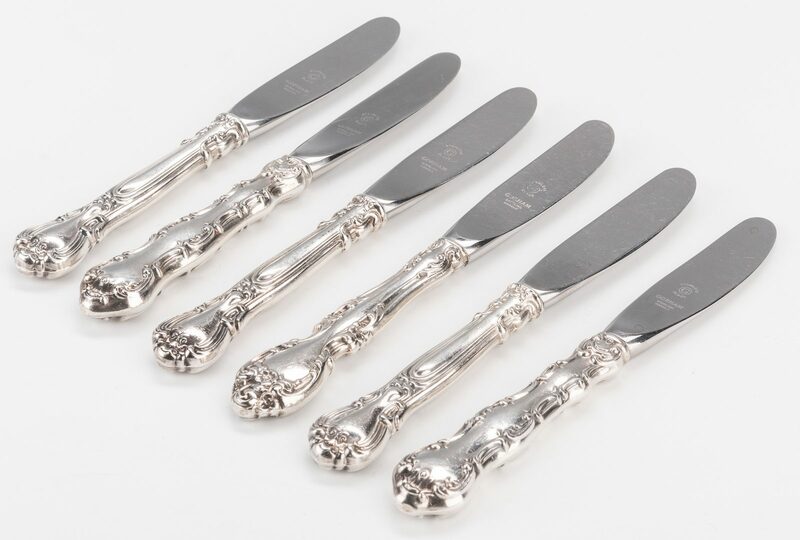 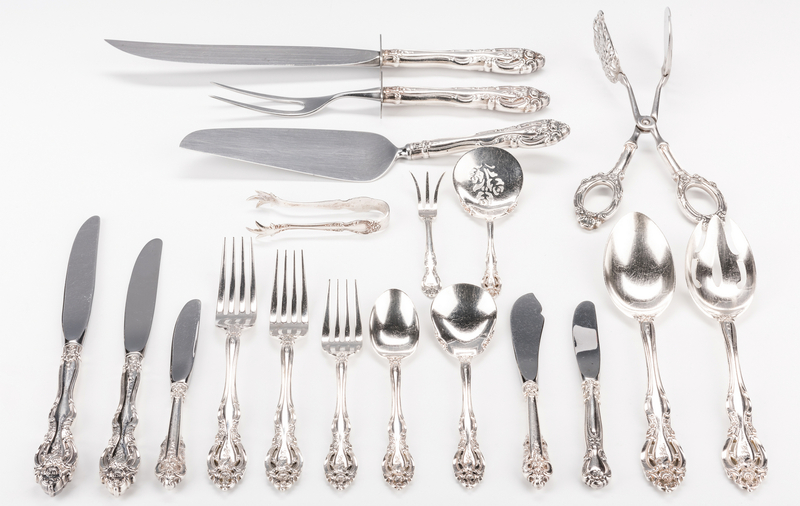 Lot 66: Gorham La Scala Sterling Flatware & more, 145 pcs. 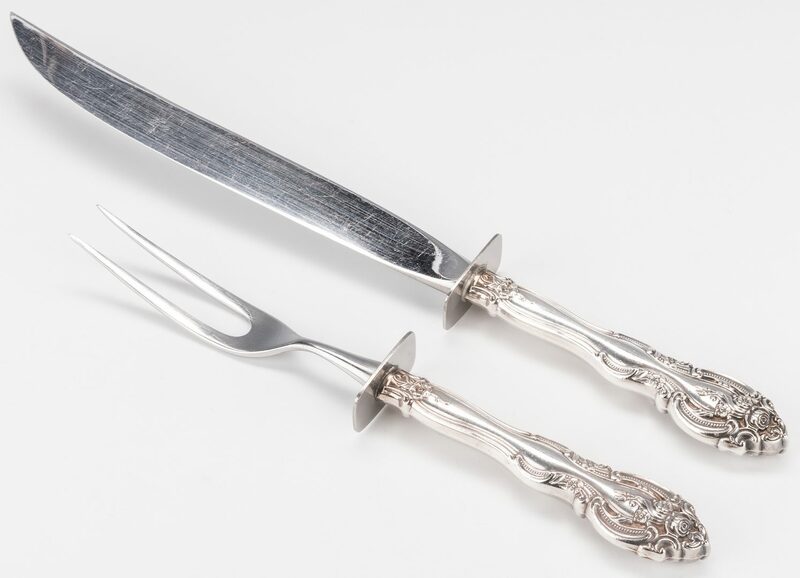 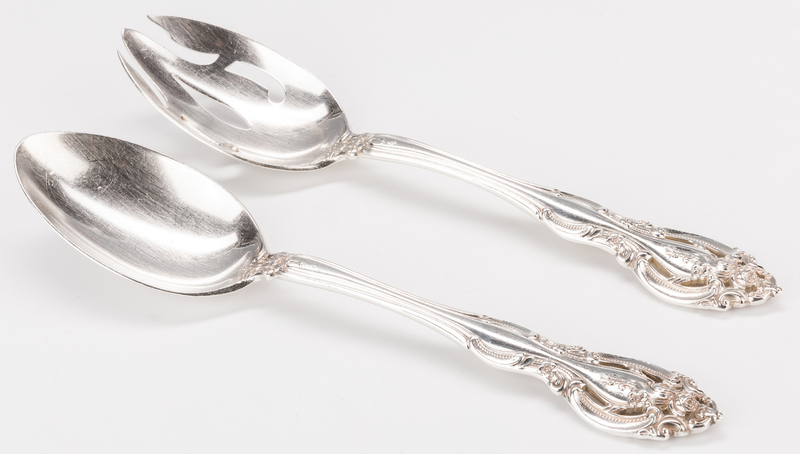 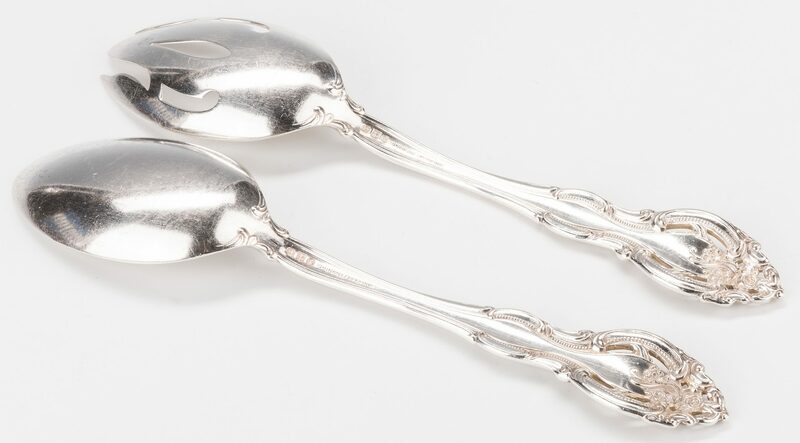 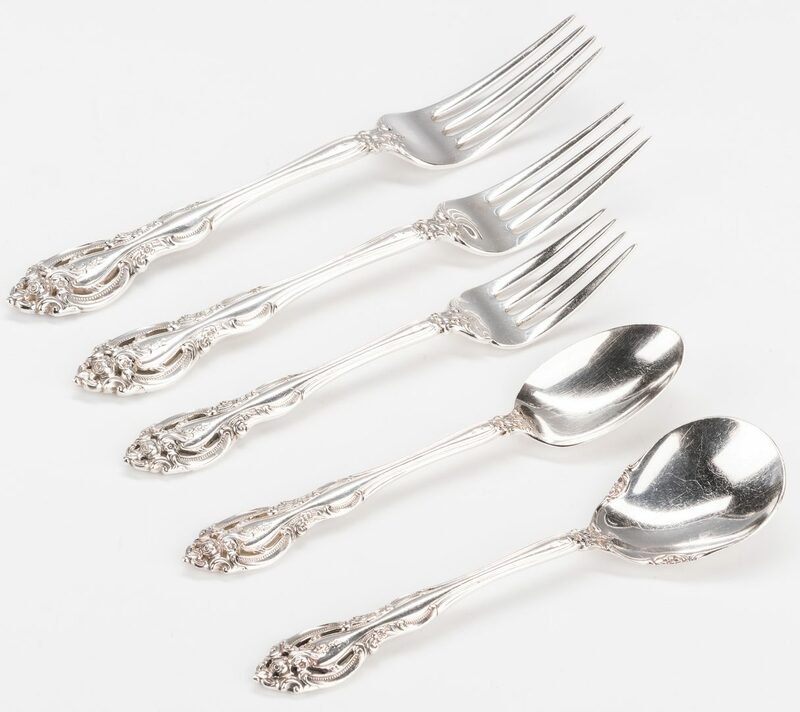 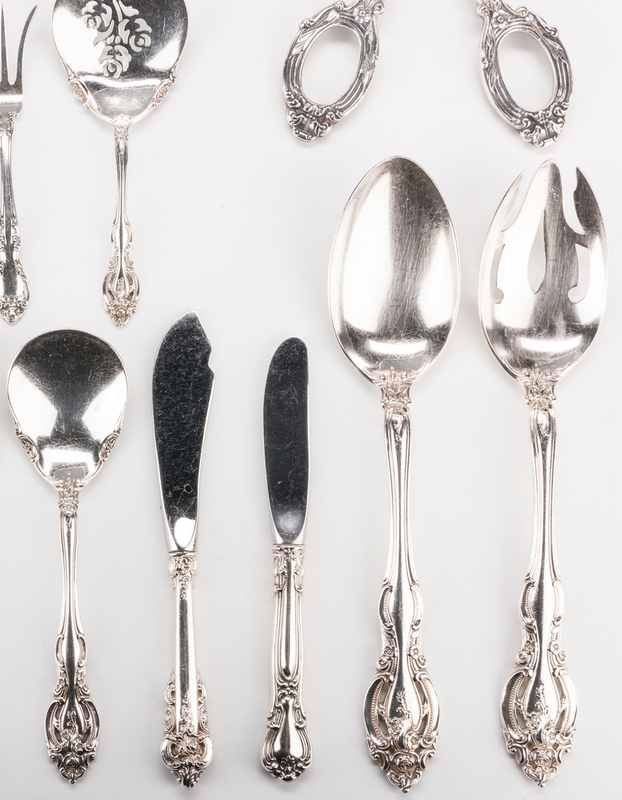 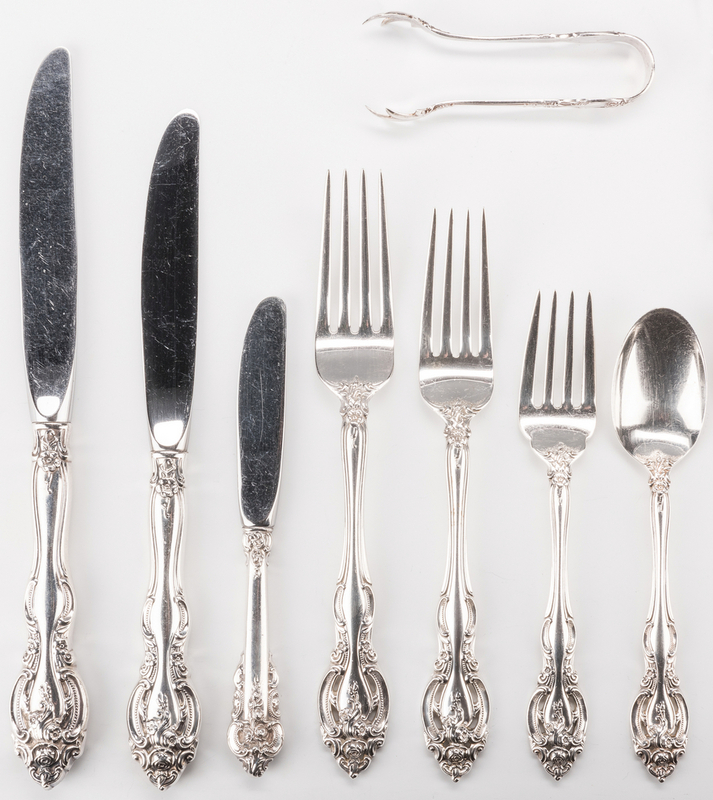 You are here: Home >> January 27, 2018 Historic Winter Auction >> Lot 66: Gorham La Scala Sterling Flatware & more, 145 pcs. 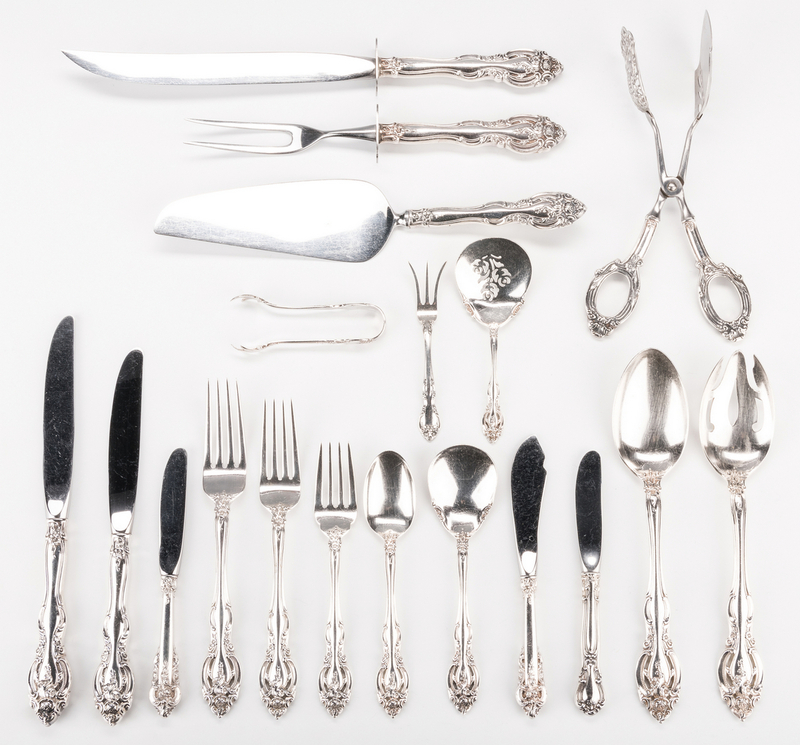 145 pcs sterling silver flatware, including Gorham La Scala pattern. 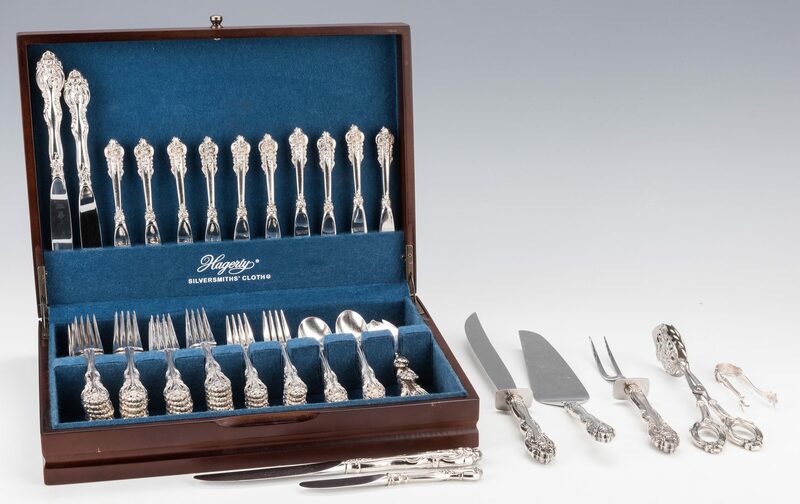 1st grouping: 125 pieces in the Gorham La Scala pattern, including 39 dinner knives: 20 knives (9 3/4" L), 19 knives (9 1/8" L), 41 dinner forks: 20 forks (8" L), 21 forks (7 1/2" L), 20 salad forks (6 3/8" L), 18 teaspoons (6 1/4" L), 1 tablespoon, 1 pierced tablespoon, 1 bon bon spoon, 1 sugar spoon, 1 pie and cake server, 2 piece carving set. 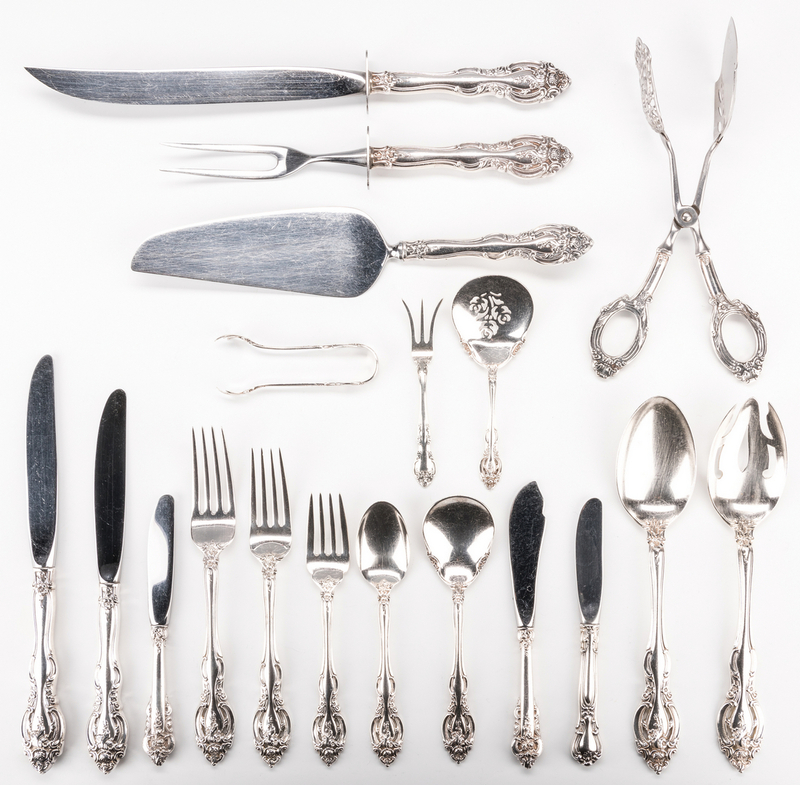 2nd grouping: 20 pieces assorted flatware including 11 pieces in the Wallace Grande Baroque pattern: 10 hollow butter spreaders and 1 hollow master butter knife; 3 Gorham Chantilly pattern hollow butter spreaders; 2 Gorham Strausbourg pattern hollow handle butter spreaders; 3 pieces Gorham Melrose pattern: 1 hollow butter spreader, 1 lemon fork, 1 pair of sugar tongs; and 1 pair of German pastry tongs marked "Web Sterling" on handle. 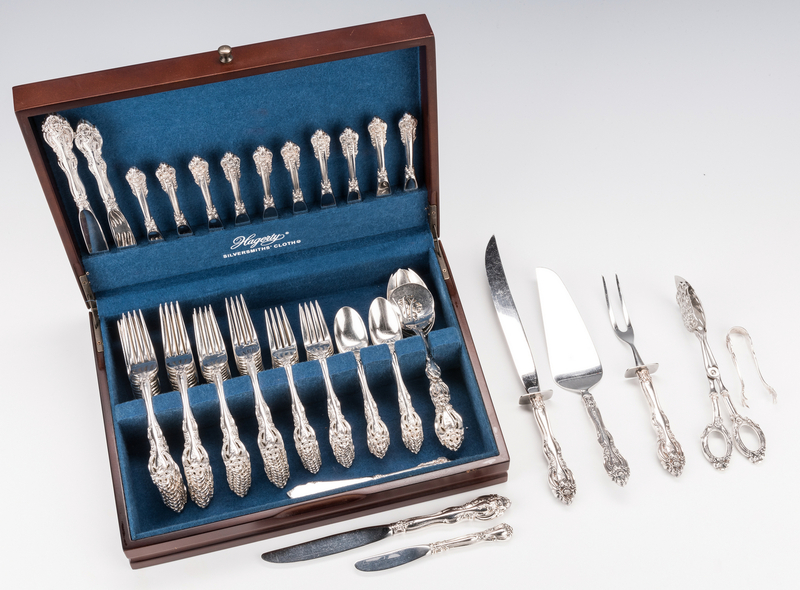 Lot includes one fitted wooden box. 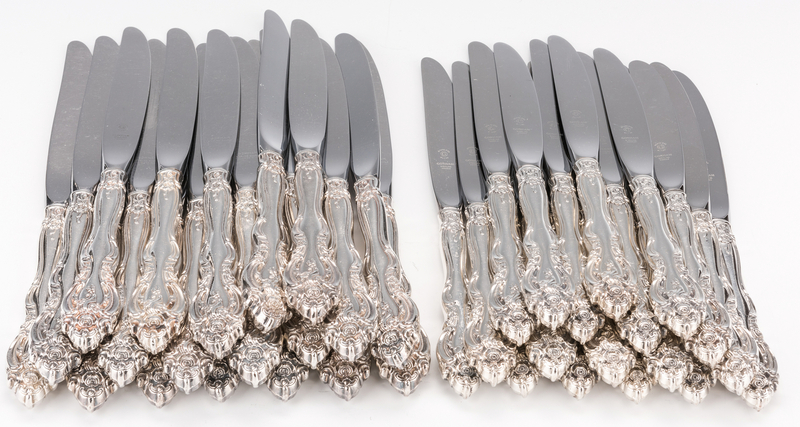 160.87 total weighable troy ounces. 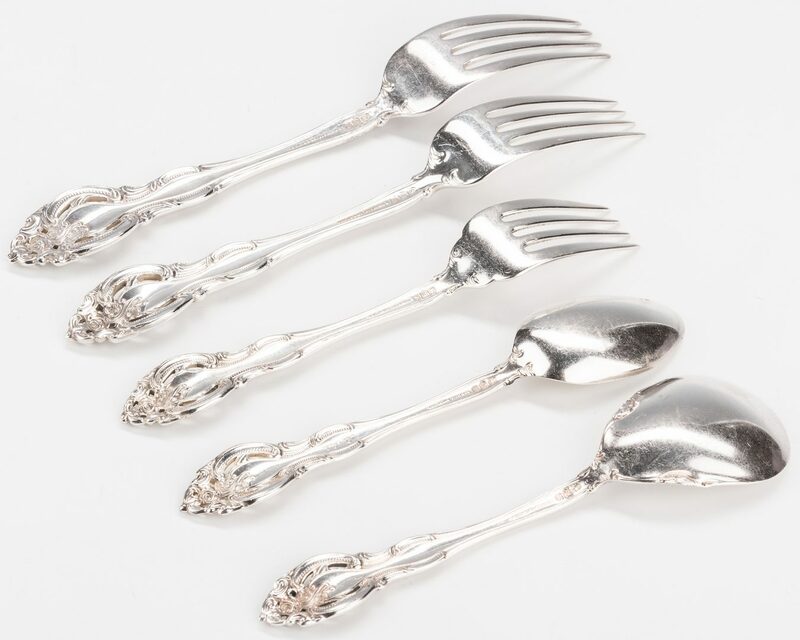 CONDITION: Overall very good condition with surface scratches. 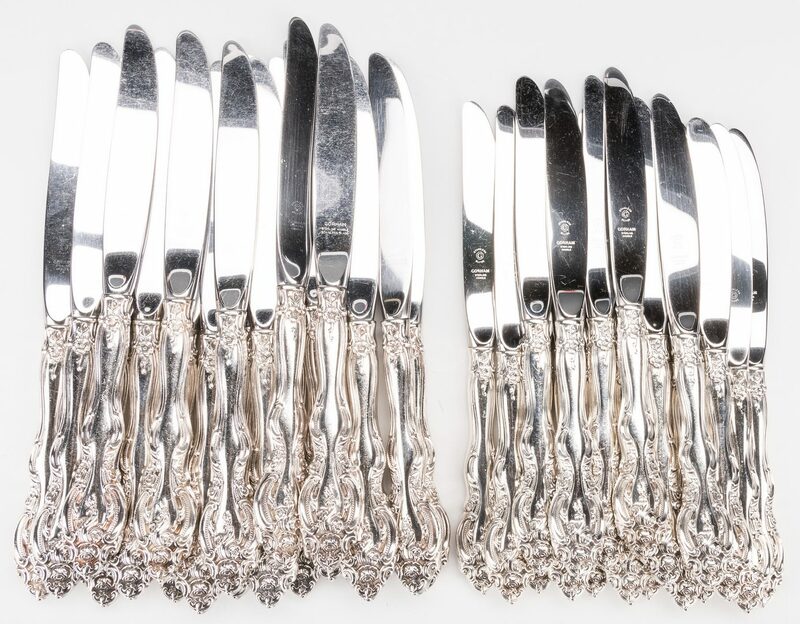 Pieces not monogrammed.